The collaboration platform, Slack, in March 2015 disclosed that its users’ data was compromised by hackers for four days in February. The compromised data included email addresses, usernames along with the encrypted passwords, Skype IDs and phone numbers that users had associated with their accounts. Although the unauthorized access was blocked and additional infrastructure changes were made, it was the case of a too late act and the damage was already done with regard to the users’ compromised information and the company’s credibility loss among its investors and corporate users. The media streaming service, Plex, also had a similar experience with their forums and blog servers being hacked and data like the email addresses, IP addresses, messages and encrypted passwords stolen. The incident went a step further with hackers blackmailing the company for some 9.5 Bitcoin (valued at over $150,500 now) to have the data released. The hackers threatened to release the data on Torrent networks if their demands were not met. There is still no clarity from the company on whether their demands were met. The security-leading industries were also not left by the hackers. A top 10 US Bank that lacked the two-factor authentication was used by gateway hackers to steal the customer data after they got the log-in credentials of a bank employee. The data security team of the bank failed to upgrade one of its servers with the MFA implementation that left a gap for the intruders to enter inside the cloud data. The solution should involve the BYOD concept and the MFA needs to be done via a swipe on their mobile, a one-time password delivered by SMS or voice or by using a hard token. When companies implement strong authentication to legacy and cloud applications it becomes easier for the end users and IT administrators to access the data using a mobile app. Also, the MFA solution should integrate easily with dozens of third-party MFA providers. Thus you can get the much-needed cloud security without the additional expense of replacement software or custom development. 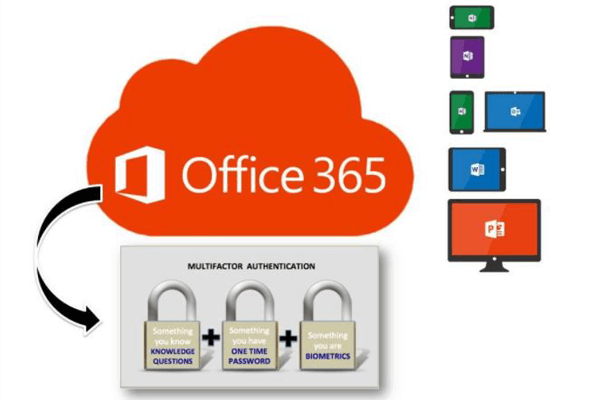 With Multi Factor Authentication in Office 365, you, of course, add another level of data security. And with the third-party MFA solution providers, you secure all of the apps including Microsoft and other Software as a Service (SaaS) applications.